Last week, Sen. Barack Obama became the first black man elected to be president of the United States. This flies in the face of those who would argue that America is inherently a racist nation, or that the vast majority of whites harbor innate prejudice against blacks. NY Times science writer John Tierney looks at some of the studies of racial attitudes in America, and reviews them in light of the recent election results. Or at least your genes. A new study has found that men in Arab countries carry two different versions of a gene set called “Haplogroup J.” Those with one set come from wetter lands, and are descended from farmers. Those with the other set come from drier lands, and are descended from herders. Scientists speculate that climate change in the Middle East some 11,000 years ago split the population in two. As lands grew drier, some people were still able to farm, but others had to give up the farm and turned to sheep herding and similar pursuits. The two groups didn’t mix much thereafter, and eventually evolved slightly different genes. The division of the population into two groups also affected material culture, such as the pottery each produced; lifestyle; and possibly even religion. A recent study at the University of Minnesota debunks the link between prostate cancer and race. The study finds that different treatment is the more likely cause of different outcomes between races. Did you miss the RACE exhibit at SMM? I meet a lot of visitors who ask if it's still here, even though it ended in May and is now on display in Detroit. But this Sunday, on public television TPT 17, you can see a rebroadcast of "What is Race?," a program that the Science Museum produced with Twin Cities Public Television's Minnesota Channel for the exhibit. It airs at 7:30 p.m. 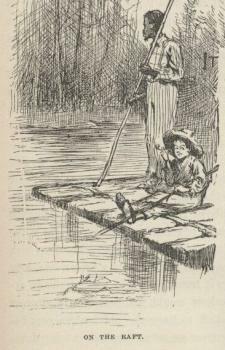 The Adventures of Huckleberry Finn: Huckleberry Finn and Jim, on their raft, from the 1884 edition, that copied from English Wikipedia. Source: Project GutenbergI moderate the queue for the Scientists on the Spot and Dr. Alan Goodman was asked a really good question about Mark Twain and Huckleberry Finn. It's getting a lot of great feedback, so I thought I would move the thread over here where other folks can chime in on the discussion. A high school student in Minnesota recently raised concerns about reading Huck Finn as part of required curriculum for their English class. Their concern is Twain's use of racially charged language. What are your thoughts on educational standards that involve "classic" works, literary-historic-artistic value to culture that include language and sometime arguments and ideas that can be experienced as bigotry by today's students? Although I do not teach fiction and literature, I actually have the same sorts of concerns with historical sources and even science books and articles. For example, students in my class frequently critically read scientific and popular writings from the 19th and early parts of the 20th century that are virulently racist. While such writing can cause pain, I think in the end the worse problem is to ignore the past. There are many valuable lessons. I have a couple of thoughts about how to present “racist” literature. It is important to put the work in its historical context and in the case of fiction, to provide a sense of what the author’s intentions and motivations may have been. I think it is also critical to understand what was acceptable and common in the past. Finally, these are the ideas and worldviews that shaped our society. Such racist language – and the thoughts behind the language – are still around today. Reading Huck Finn could lead to a valuable class discussion about how the forms of acceptable language have changed compared to the underlying idea about race and racism. The world premiere RACE: Are We So Different? exhibit is showing Science Museum visitors that race has an impact on our lives each day, often in ways that are hidden or undetected by popular media. In conjunction with the exhibit, the Science Museum is drawing upon local, regional, and national perspectives and inviting visitors to explore an in-depth understanding of race and its impact on our society during a speakers’ forum this spring. Each forum includes live entertainment, a featured speaker, time for reaction from a panel of respondents, and questions from the audience. and Sandra Vargas, Hennepin County Administrator. Admission to the RACE Forums is $12 per person ($8 for members, seniors, and students and $4 for individuals with limited incomes) and includes admission to the RACE exhibit. Forums take place in the 3D Cinema. Doors open at 6:30 p.m. Please help spread the word! To make reservations, call (651) 221-9444. American Indians in Science festivities are free with museum admission and run from 1 to 4 p.m. throughout the museum. Disney recently announced its first black princess, Maddy, who will star in "The Frog Princess," expected to open in 2009. Princess: Is it important for kids to have favorite characters that look like they do? Briar Rose, from "Beauty and the Beast"
Ariel, from "The Little Mermaid"
Do you think it's important for princess-loving little girls to have heroines that look like them? A study published in the American Journal of Education showed that over one-quarter of black college freshmen were immigrants from Africa, rather than native born – twice as many as in the general population. For Ivy League schools, the figure was 40%. Diversity initiatives and race-based financial assistance, all designed to help black Americans, have ended up helping foreigners rather than the native-born – precisely because the programs are race-based. Do you agree? Is racism still a problem that needs to be addressed directly? Or is the real problem poverty, or lack of opportunity, or something more color-blind like that? Leave a comment. 1)	thanks largely to immigration, the US is a more diverse country today than it was 40 years ago. People of different races have a much higher chance of meeting and falling in love. 2)	There has been a trend toward marrying later in life. An adult in their 30s or 40s is less likely to submit to parental pressure than someone in their early 20s. All this has led to a great change in attitudes. In 1972, some 39% of Americans still felt there should be laws against inter-racial marriages. 30 years later, that had shrunk to 10%, and was even smaller among young people, meaning this taboo is clearly fading from American life.